“For Beauty Smith was cruel in the way that cowards are cruel. They can’t be men to men, but must be brutes to anything weaker than themselves”. White Fang, a gray wolf-dog born in the north, is adopted by an Indian tribe with his mother Kiche where he must learn to respect the human hand , that has brought him nothing but pain. White Fang is soon traded to Beauty Smith, a cruel man that treats White Fang with no respect, and forces him to fight for his life against other dogs. Shortly after White Fang’s near death experience, he is taken in by Weedon Scott, where he must learn the law of the house before he is accepted into the hearts of the family. 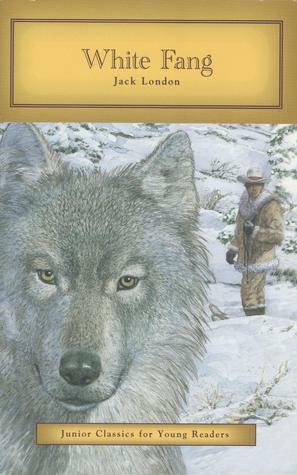 White fang is a classic realistic fiction novel that is set in the North, Fort Yukon, and the Judge’s manor. The book is about a wolf pup (who is later named White Fang) and his hazardous adventure through life. White Fang comes across cruel owners such as Beauty Smith, but also by a loving owner, Weedon Scott . In my opinion, this book is not a must read. I would recommend this book to students 5th through 8th grade because of the illustrations and the heavy subject matter. The readers should be mature to read this book because it is tragic, but also filled with action. The conflicts of the book consist of the struggles that White Fang experiences at the times he is owned by cruel men. Moving on, Jack London sometimes adds too much detail into his writing, while at other times, he does not add enough. For example, in some of the fights that White fang encounters, the author could simply state, “White fang leaves him dead”. At other times, Jack London writes in detail and it encourages the reader to keep reading. The author frequently leaves you with a cliffhanger right as the chapter ends, leaving you in suspense and motivating the reader to read on.